Masterpiece – a deserved name for a stylish, eye-catching safe that enhances the luxurious atmosphere of your living room. Safes have long since shaken off their negative image to become trend articles and expressions of good taste and personal style. Today – if you want them to be – safes are much more than “only” a safe place to store watches, jewellery, works of art, cash and documents. The high-end brand “Signature Safes by HARTMANN” opens up completely new horizons and endless possibilities: safes that are adapted to meet individual customer requirements – down to the very last detail. The “Masterpieces” play a special role here. They are absolutely, uniquely individual, do not look like safes at all at first glance, and therefore fulfil the requirements of even the most demanding individualist. For decades, HARTMANN TRESORE has been one of the leading safe suppliers in Europe and the Middle East. Its comprehensive product portfolio ranges from all types of safes for private and business use to strongroom doors and entire strongrooms. However, the “Signature Safes by HARTMANN” are a truly perfect combination of security and beauty. All safes in this series are unique items built in accordance with the customer’s special requirements; mainly watch safes and jewellery safes for discerning customers whose love of individuality and personal style also extends to matters of security. “Masterpieces” are the high point of the this premium Edition range; elegant safes that emphatically express the owner’s individuality and particular taste. Perhaps you already have some ideas for your own private masterpiece? We will be glad to discuss them with you. But first let yourself be inspired by some of the safes we have already designed and built for our customers. The safe “Egoiste” is an outstanding example. The work of fashion designer Miklós Schiffer, this oval safe was created with a combination of exquisite wenge wood and cream-coloured, hand-stitched leather. It offers numerous shelves, drawers and watch winders – thus providing ample space not only for valuable watches and jewellery, but also for other valuables and special mementoes. “Egoiste” could easily serve as an inspiration and model for your own safe – and private masterpiece. 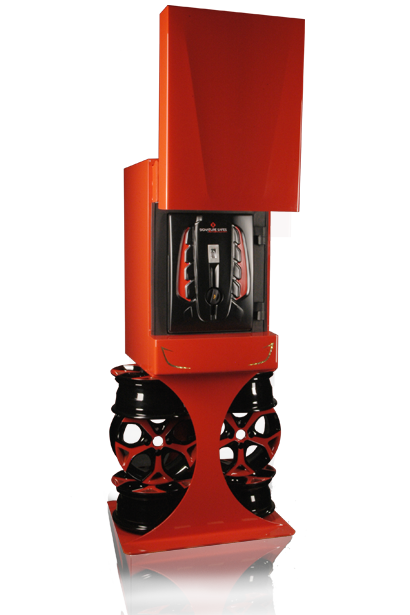 One of the most unusual “Masterpiece” safes ever to have left our factory is undoubtedly the model “Undercover” – a magnificent item painted a glossy scarlet and shaped like the sleek nose of a racing car, with a concealed door. The innovative biometric fingerprint lock is operated by swiping a finger across a scanner. Just the right safe for a man who has kept a keen sense of adventure but still wants reliable security. However, there are plenty of other possibilities. Some particularly impressive features of our masterpiece “Python” are its snakeskin-look leather lining, its glass shelves, lovingly appointed, spacious drawers and comprehensive LED lighting. This elegant safe also offers space for six watch winders. The “Zeitgeist”, on the other hand – “Zeit” is German for “time”, as well as “age, era” – is devoted wholly to time(pieces): the safe contains 56 watch winders and offers ample room for an extensive watch collection, which can be displayed securely but to its full advantage behind the armoured glass door. Our “Masterpieces” may look strikingly unique, but they all offer security first and foremost. It goes without saying that HARTMANN TRESORE guarantees professional delivery, installation and anchoring of your safe, because a strikingly attractive safe, in particular, must be so well protected that any attempt to burgle it has no chance of succeeding. HARTMANN TRESORE – with due consideration of the relevant technical security aspects – implement any and every customer requirement perfectly. How would you like your safe to be? Should it be a particular size or colour so as to harmonise with your interior décor? Should it have a panelled exterior to look like an elegant wooden cabinet? Perhaps you would like a safe with gold- or platinum-plated handles and fittings, an exciting leather-look exterior or a bulletproof glass door to display the secure contents? Or how about a safe designed to look like a colourful work of art that harmonises with the modern, stylish surroundings of your home? One thing is certain: a Masterpiece does not need to look like a safe! Both the outside and the inside of your safe are custom-built to suit your needs. Create and develop your ideas – we will help you turn them into reality! Of course, it is entirely up to you to decide what you keep in your custom-built safe, but when making your plans it is advisable to consider which personal “treasures” you would like to store securely in your safe and how much space they may require. The design and construction of a safe are often a result of the special requirements the interior must fulfil, so it cannot hurt to plan ahead. Does there have to be room for watch winders, or will drawers suffice? Or if you want to use the safe mainly for storing gems and jewellery, how many small, flat drawers will be necessary and how should they be equipped? Do you need pull-out compartments for valuable coins and medals? Or perhaps pigeon-holes for stamp albums? If you would like to keep certificates and other valuable documents in your safe, it makes sense to have a compartment high enough for an A4-size folder. We will be glad to discuss the possibilities with you – after all, we want your safe to be perfectly equipped and tailored to suit your exact requirements! Safes which are as unique as their owners – that describes our Masterpieces. Custom-built, highly unusual safes for discerning customers who also regard security as matter of style and personal taste. Masterpieces do not follow any set pattern, but bear the unique, unmistakable signature of their owner, give an insight into his or her personality, character and special individual preferences. Let us work with you to create your own personal Masterpiece! Whether it is a watch safe, jewellery safe or Masterpiece – we will build the safe that fulfils your personal wishes and requirements in every detail. HARTMANN TRESORE safes are tested and certified to European standard and available in all resistance grades. Unique safes – our Masterpieces. As diverse as the people they are designed for.